The United States Patent and Trademark Office (USPTO) announced in a press release that the University of New Hampshire School of Law Library, which was designated as the Concord Patent and Trademark Resource Center (PTRC) on January 30, 2012, is now open to serve the intellectual property (IP) needs of the public. Currently, PTRC designated libraries can be found in 46 states, the District of Columbia and Puerto Rico. This network of more than 80 public, academic, state and special libraries assists a variety of customers including inventors, intellectual property attorneys/agents, business people, researchers, entrepreneurs, students and historians. In addition to offering free electronic services and resources designed to support the intellectual property needs of local and state patrons, the Concord Patent and Trademark Resource Center will employ USPTO-trained librarians to provide customer assistance on the use of the agency’s patent and trademark databases and public seminars on intellectual property topics for novice and experienced users. California leads the USA in innovation, or does it? Remember? We already told you about Utility patents. They are the most common patent type and a primary means of protecting intellectual property and technological innovation. IFI CLAIMS®Patent Services recently announced its top-50 ranking of global companies awarded the most U.S. utility patents in 2011. IBM remains in the first position, as it has for 19 years in a row, with a record of 6180 utility patents. Samsung trails second with 4894 and Canon replaces Microsoft in the third slot with 2821. According to IFI, the USPTO issued 224.505 utility patents in 2011, an increase of two percent over 2010’s record breaking total. 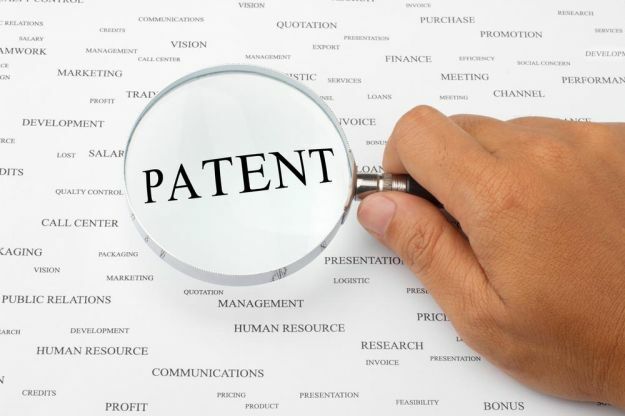 While preparing the 2011 Patent Intelligence and Technology Report, IFI analysts took a closer look at the 2011 US patent grants and in particular the location of the inventors named on these documents. Despite the obvious surge of Japanese, Korean, and Chinese companies in the Top 50 assignees, 50% of US patents in 2011 named US inventors. As you see California is the clear leader with respect to the overall volume of patents accounting for 15% of the total number of US utility patents granted in 2011. However when you factor in population, IFI analysts find Vermont at the top of list along with Massachusetts and New Hampshire. 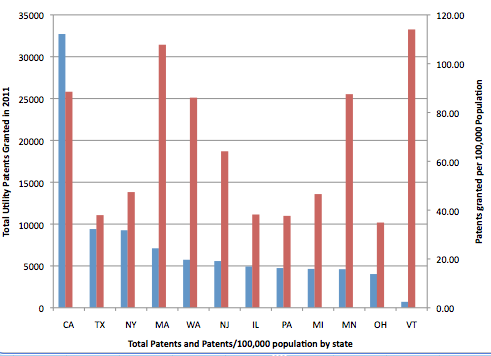 The figure below shows a graph of the top 10 states by number of utility patents granted, and the number of patents granted per 100.000 residents. So what exactly is going on in Vermont that accounts for its performance? The IFI analysts looked at the assignees and found IBM accounting for most of the patent activity. How come? IBM has a large facility in Burlington that designs and produces semiconductors.